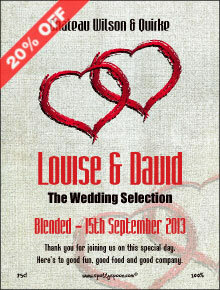 Wedding Day Celebration Wine Label. 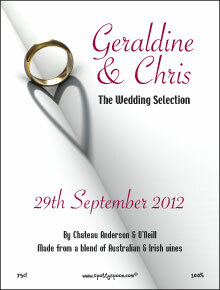 Impress your Wedding Guests with your own personalised wine. Enjoy with friends and family at The Royal Court Hotel. Don't just have dull table wines - make your own affordable and easy to use wedding wines. 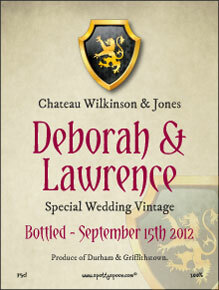 Bespoke for the special day, this wedding wine label sticker can be placed over the existing label to transform the ordinary into something unique. 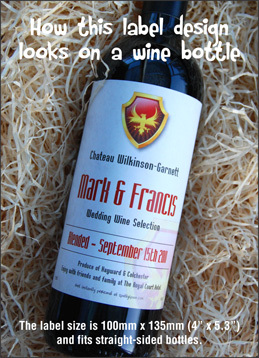 With the new Husband and Wife in the centre and their married and maiden names under the crest this label is an easy way to add a special touch to the big day. 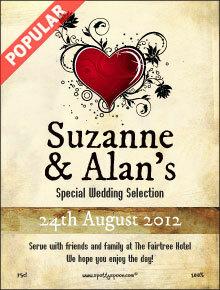 It's also ideal as a simple wedding gift - a little different from simply choosing from a wedding list. Why not be personal with the text and put things like 'The choice of (his job) and (her job)' 'Also ideal with (eg. steak and onions)', 'Often drunk in (eg. The Stags Head)'. Also, see our Wording Ideas page for other text tips.